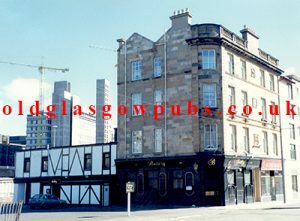 652 Argyle Street, Glasgow, G3 8UF. Tel: 0141 221 8188. Established on June 1870 this is one of Glasgow’s hidden treasures. Now an exclusive restaurant one of the best in the city and definitely one of my favourites. This was once called the Shandon Bells, owned by Lawrence Brady in the 1930s and 40s. Lawrence also had Shandon Bells in Scotland Street, Candleriggs and Abercromby Street off the Gallowgate. This is said to be the oldest restaurant in the city of Glasgow. I don’t know who started this rumour but this old establishment was once an old wine shop. 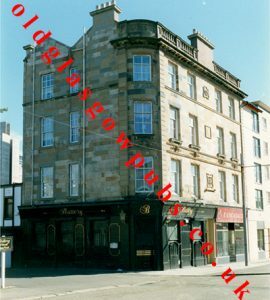 ….. to read more on the history of this old establishment, please check back soon for our second book. 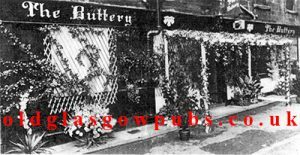 The unpretentious exterior of the well-known and popular Glasgow restaurant, The Buttery, off Argyle Street, was transformed when Rentaflower moved in for the day. The company’s aim was to demonstrate how frontages of eating places, hotels and car parks can be brightened by the use of floral decorations. At The Buttery the display took the form of a Spanish type pergola, complete with vine; roses, gladioli, snapdragons, delphiniums, coriander, and yucca plants. The Shandon Bells. Thanks to Scran for the image. The owner Mr Peter Lamont with staff and customers of the Shandon Bells. 1950. This group of customers and staff are going on their annual outing. This happened on a Sunday when the pubs closed. 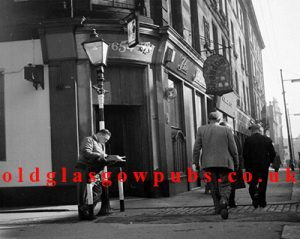 Many of Glasgow’s old pubs did this annually and went to places like Rothesay, Millport, Ayrshire, the Trossacks and Loch Lomond. 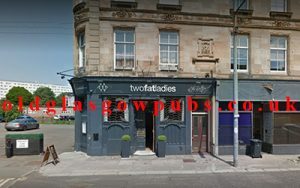 The Buttery was closed a few years ago and is now the Two Fat Ladies. Do you remember the Shandon Bells or the Buttery? If so please leave a comment.